This quaint little cabin is the ideal location for a romantic getaway. Enjoy the sublime location of Fox Cove and the comfort of this cozy, well-equipped one-story cottage. Wood and stone create a cabin feel, while high-quality stainless steel appliances add to the environment of both comfort and quality. Beautiful ledge rock shoreline, dining nook with lake view, comfortable beds and convenient Lutsen location are just a few of the reasons to rent Fox Cove. 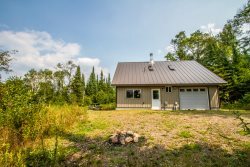 This cottage is located on the same property as the main cabin Foxfire. The two cabins are about 30 feet apart and when rented in conjunction with Foxfire, it's the perfect spot for a large family or family reunion. Each cabin has its own parking area and private entry. The two cabins share 300 feet of private Lake Superior shoreline for you to enjoy during your stay here. The shoreline is perfect for watching the gorgeous sunrise over Lake Superior and for listening to the waves roll in onto the ledge rocks. PLEASE NOTE: Access to this home is via a staircase from the parking area that may difficult for some people to manage. You will not be able to park near the cabin and will need to carry luggage in from the parking area above. Please feel free to call if you have any questions about the staircase. We loved the house, it is quaint and cozy. The sound of the water is very soothing. The location is very good, about 15 minutes from Grand Marais with a cafe, tons of gift shops, light house with gorgeous rock formations by the water. I wish we didn't have to remove all trash out of the house ourselves. That was something you don't normally have to deal with on vacation. The in floor heating was very nice. Stayed comfortable when it was below zero overnight. Great spot with views of the lake the only problem we had was figuring out the direct tv. It would be nice to have had some instructions. Great location, sweet cabin. All the amenities you need. I loved the location of the cabin. Once we got the cabin warm, it stay nice and cozy. The cabin is beautiful and we love the way it sets on the edge of the ridge overlooking Lake Superior. The sunrise and sunset is an awesome view and listening to the waves splash against the rocks omg. Cute little cabin, beautifully furnished, warm in-floor heat. Large windows overlooking Lake Superior. Great water quality. Best part is the *fantastic* wave action of the Lake. We were very happy with our rental. The unit is very nice for two people and has an amazing view of the lake. The cabin has in floor heating and remained comfortable even on cool mornings. We enjoyed cooking breakfast in the kitchen each morning and eating in the small dining room with a wonderful view of the lake. The kitchen could use a few mixing bowls however. We were able to have a few fires down by the lake at night and the owner even had metal marshmallow roasting sticks to use. Note that when you rent the smaller unit, the much larger house is now unavailable. This means you get to use the beautiful deck on the main house which has a nice selection of furniture and excellent views. All in all, we were very happy with the cabin and would happily stay there again. We where looking for a secluded spot on Lake Superior to celebrate our anniversary and do some hiking. Fox Cove was exactly that. The home was a perfect mix of cozy comfort and modern facilities. The landscape and vegetation of the property provided a private feel and separation even among close adjoining landowners. Check-in went great, no additional service was needed. I loved this beautifully built and very comfortably furnished little cabin. Great location, had everything I needed (except a fly swatter:-)and being able to use Foxfire's big deck was great. My favorite part was I was staying there alone and I felt so safe hidden away in that private spot. Cascade Vacation staff were wonderful as always.